Are you interested in generating wealth and creating a passive income? Cap rates – Return on Investments – Creating Accessory Apartments – Building Wealth Through Real Estate – These are a few of the investment buzzwords floating around. Whether you have many years of investing experience or no experience at all, we are here to help you make smart choices so you can maximize the return on your real estate investment(s). A large part of our business year after year is working with real estate investors. 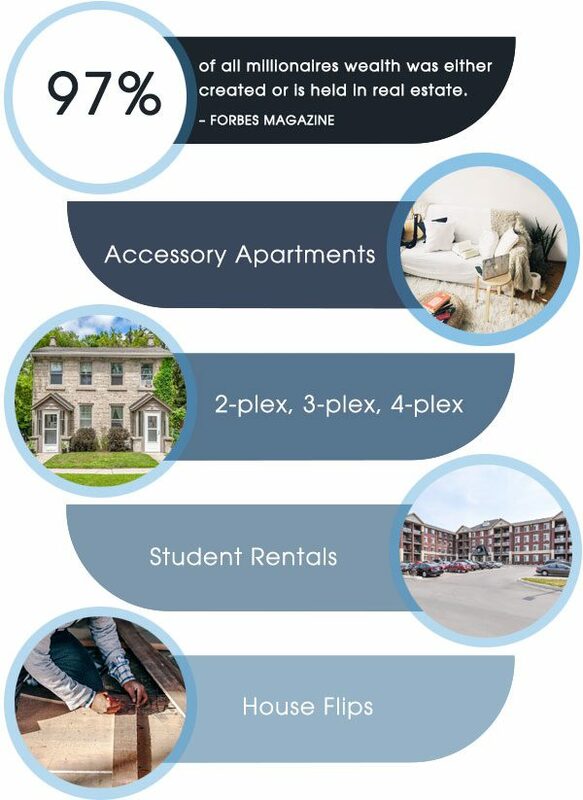 Whether looking for a student rental, a unique downtown 4-plex, a bungalow with an accessory apartment, or a house flip project, we have clients that have done it all. We teach you Real Estate Investing from the ground up, sharing strategies, projecting revenue and forecasting growth. We learn your short term and long term goals, find properties aligned with your investment criteria, and confirm if it’s a smart move. Don’t waste your time or money going to Real Estate seminars, you can learn far beyond working with the Hudson Smith Real Estate Group. Hudson Smith provides a tailored service that takes into account your goals while minimizing risk; take a look at Hudson’s ‘for sale’ properties and you can expect an honest account what each property has to offer. Search all property listings in Guelph and surrounding area directly form our site (updated in real-time so you don’t miss a listing). Hudson will handpick investment properties for you to consider, based on your investment goals. When you choose to buy real estate through Hudson Smith, you’ll benefit from expert knowledge and advice, as well as superior negotiating skills. Experience the difference a first-class realtor brings to the investment property buying process. Hudson brings a wide array of skills to the table including listening to your real estate needs and wants. Gathering specific key information ultimately leads to finding the perfect investment fit. Hudson and his team are extremely skilled negotiators that work tirelessly negotiating for the investment property you want at the best price. Put us to work for you!